E3 Consulting has helped a leading property company make significant tax savings over the refurbishment of an iconic London landmark. 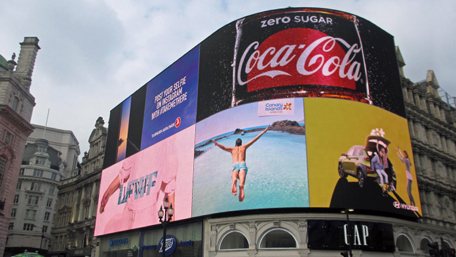 Piccadilly Lights, the iconic advertising space at London’s Piccadilly Circus and one of the UK’s most recognised landmarks, had a digital makeover and was re-launched by owners Landsec, the largest commercial property development and investment company in the UK. Viewed by more than 100 million people who pass through Piccadilly Circus each year, Piccadilly Lights has been owned by Landsec since 1968. This latest upgrade replaced the original patchwork of LED screens with a single state-of-the-art 4K LED digital screen. The screen includes a live technology hub which allows it to react to certain external factors, such as the weather or temperature. This feature enables brands to display creative and innovative content, such as weather-appropriate clothing. Following the major redevelopment in October 2017, Landsec turned to property taxation specialists, Ocean Village headquartered E3 Consulting, earlier this year to undertake the capital allowances analysis of this multi-million pound project. Alun Oliver, E3 Consulting’s Managing Director said: “Having worked with Landsec on a number of capital projects over the years, we were delighted to be asked to undertake this unique and fascinating project where we were able to identify nearly 85 per cent of the expenditure as eligible for tax relief through capital allowances”. Alun and wife Nicky, also a Director, founded E³ Consulting in 2003 and the firm is celebrating its 15th anniversary of providing property tax consultancy services to a wide range of asset managers, business owners, developers, investors, occupiers, private clients and family offices.